Written by Klamath-Siskiyou Native Seeds on February 22, 2018 . Posted in Uncategorized. Looking for some detailed information on native seed propagation and plant propagation? This manual is a great resource. Although the manual is more focused on species that grow to the north of the Klamath-Siskiyou, there are still many native plants to our area included, and even having information on related species can be very helpful. 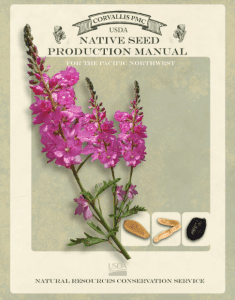 Klamath-Siskiyou Native Seeds is working hard to update our website to include more detailed plant information and seed germination instructions for all of the species we offer. Stay tuned, but for now, take a look at this manual for both information and inspiration! To view the manual you can click on the title above or view and download from clicking here.